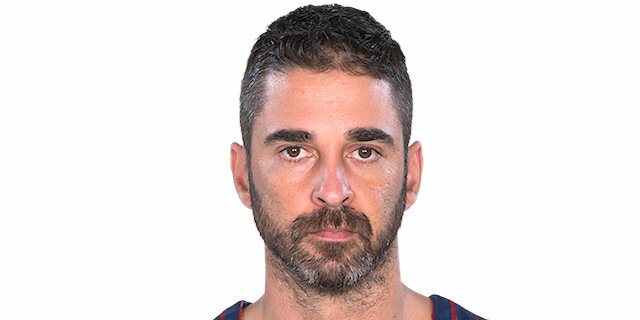 Juan Carlos Navarro added to his legend by leading FC Barcelona to a 93-78 victory over CSKA Moscow on Sunday in the Turkish Airlines Euroleague Final Four Third Place Game at Mediolanum Forum in Milan. Navaro scored 20 points and made 3 of 5 three pointers. 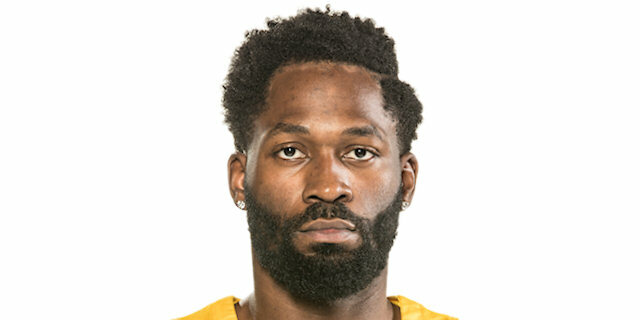 Those results helped him become the career leader in three-pointers made at the Final Four with 31, which is 1 more than retired CSKA great J.R. Holden, who now sits in second place. Navarrro also moved up to fourth on the career Final Four scoring charts with 168points. Maciej Lamp added 17 points, Joey Dorsey stood tall with 9 points, 12 rebounds and 2 blocks and Marcelinho Huertas delivered 7 points and 7 assists for the winners. 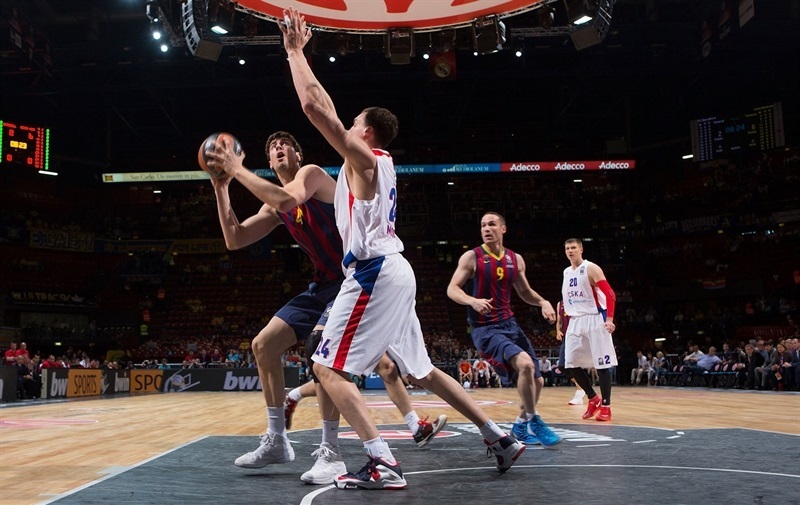 Sasha Kaun netted 13 for CSKA and Nenad Krstic 11. 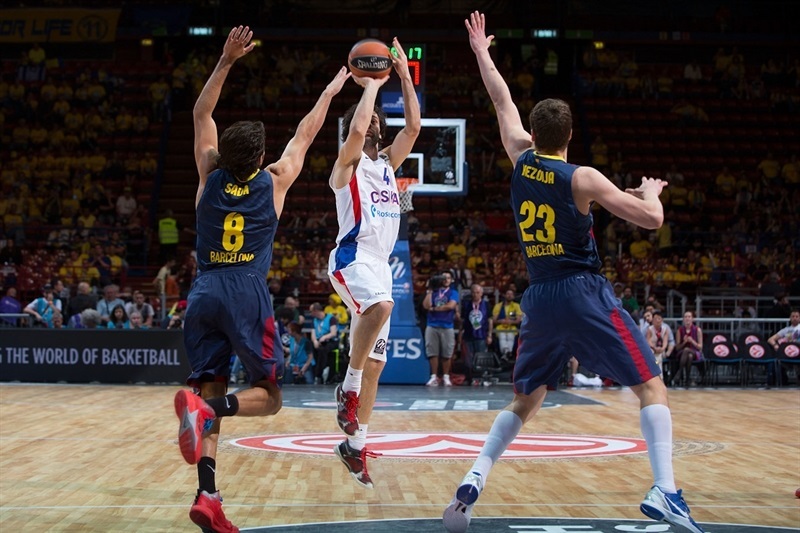 CSKA lead early, but Navarro lead Barcelona back in the second quarter. Barcelona built on that with a strong second half as the lead grew to 19 en route to a season-ending victory. 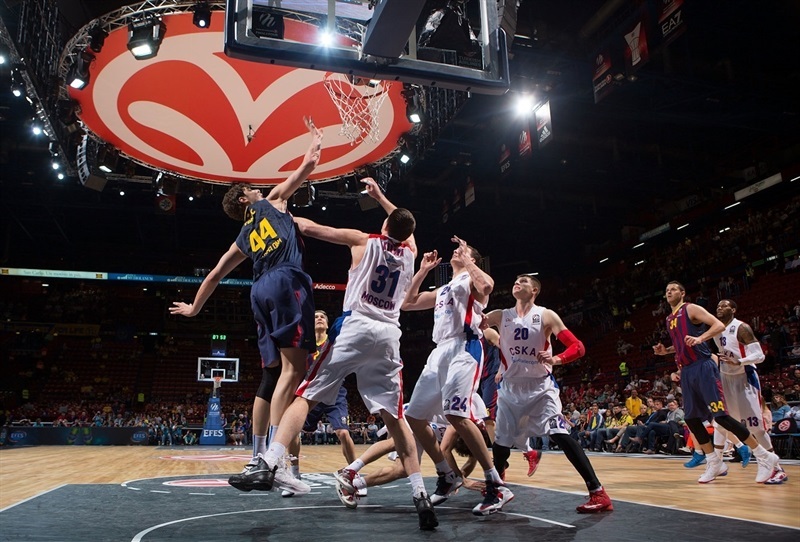 CSKA won the opening tip and scored first through Sasha Kaun on the first possession. 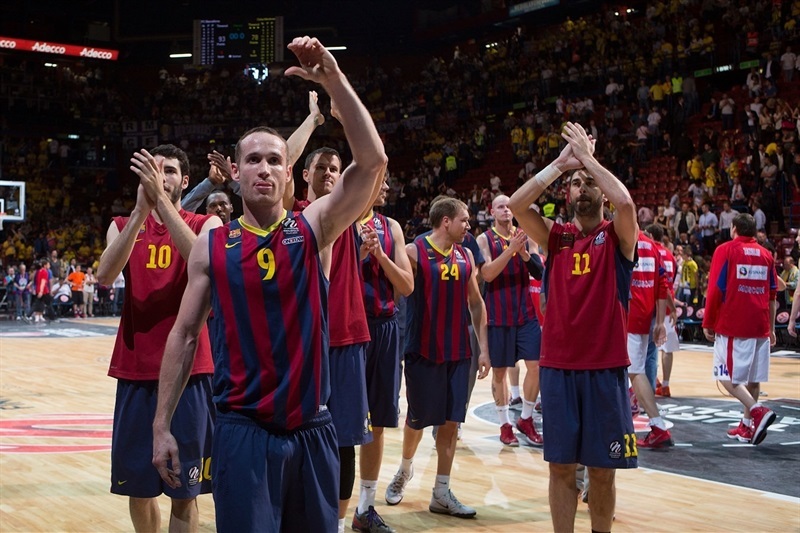 Bostjan Nachbar sank a jumper for Barca’s first points. A mid-range jumper from Sonny Weems and another two Kaun buckets- the first an alley-oop slam from Milos Teodosic. After an early timeout, Ante Tomic scored on the offensive glass, but Kaun worked Tomic over to make it 4-10. Victor Khryapa slipped after gathering a rebound and Kostas Papanikolaou was first the loose ball, which resulted in a Nachbar slam to trim the gap to 2. Huertas fed Tomic for a floater to make it 12-14 midway through the quarter. Krstic scored 4 straight points – 2 from the line and 2 in the paint – to make it 13-20. Victor Sada in transition and Papanikolaou off a pretty pass from Lampe narrowed the gap. Then Navarro stepped up with his first basket and Dorsey muscled his way to a score as Barca twice came within 1. Krstic free throws made it 21-24 through 10 minutes. A pair of Lampe three-pointers gave Barcelona its first lead. Kyle Hines got on the scoreboard with free throws, but Navarro countered with a three-point play to make it 30-26. Hines and Lampe traded baskets before Dorsey pur Barca up 6. The paced stayed fast as Alex Abrines and Andrey Vorontsevich traded threes. A Navarro basket was matched by a Kaun slam from the hands of Khryapa. Navarro made it 41-35 midway through the quarter. Navarro connected on his first three and – after Teodosic scored for CSKA – Dorsey threw down a wicked one-handed jam for a 9-point Barcelona advantage. After Teodosic scored free throws and Khryapa finished a pretty baseline drive, it was 46-41. The Russian champs continued to rally; Vlado Micov scored from the line and Krstic made it a 3-point game. Oleson free throws and Krstic inside left the score at 50-47 at the break. Both teams came out full of energy for the second half. 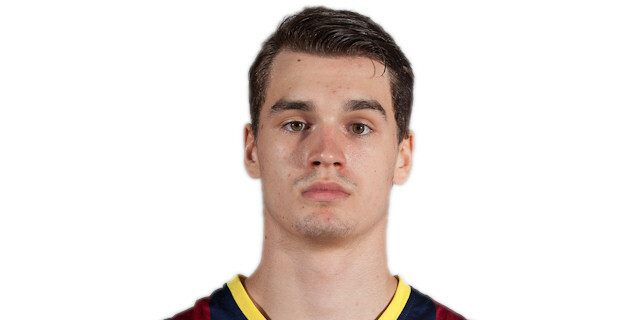 Mario Hezonja scored 3 points over two possessions to make it 55-49. 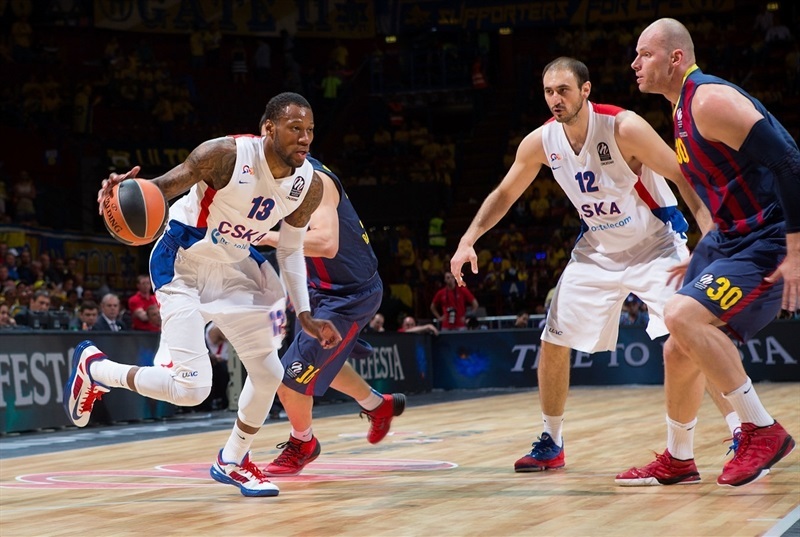 A steal from slam led to a Vorontsevich slam as CSKA worked its way back. Navarro knocked down a three only to see Kaun score again. Another Navarro three made him the career leader in triples made at Final Four games with 31. It also put Barcelona up 61-53. Hezonja and Navarro combined to give Barca a double-digit lead. Hines and Weems helped CSKA close the gap before Pargo shook off two defenders and buried a deep three to close the quarter at 69-64. An Oleson triple restored a Barcelona cushion at 72-65. Micov kept CSKA in the hunt with a basket plus foul. After Lampe and Pargo traded baskets, Dorsey entertained the crowd with another highlight reel slam. After a TV timeout, Lamp scored inside, Dorsey made an emphatic block of Pargo and Huertas drilled a three to make it 82-70 with less than five minutes to go. The lead grew as Lampe converted a three-point play and Oleson and Papanikolaou nailed threes. 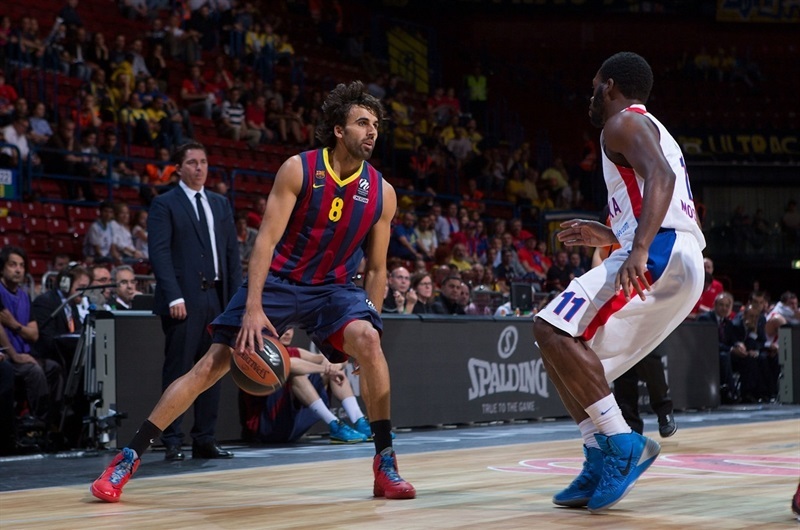 The lead peaked at 91-72 as Barcelona coasted to victory. 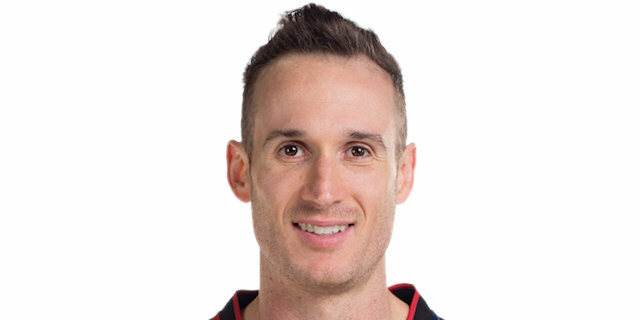 "We are very happy about this victory. We are happy too because we showed courage. We cared about it a lot. Our opponents are a great team. It takes a lot to break through the defense. We came up with a very good result and got the victory, even it’s a sour victory. We needed to relieve the pain from Friday. This is competition. As you know, we are very enthusiastic about it. That loss will stay in our heart as a pain. We always have the characteristic of being competitive and this proved it. You fail one day, but you bounce back the next day. We can look forward and hope for a bright future." 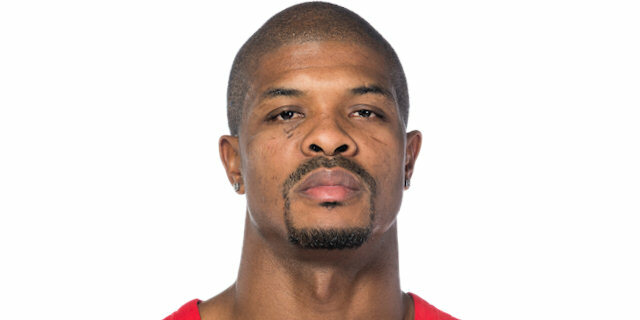 "We just had too many players who were empty after the loss on Friday. I want to thank my players for trying and one more time bringing CSKA Moscow back to another Final Four. It’s not a small accomplishment. It’s not fair to make an analysis in public. This is not the time to talk about an analysis." "The first half we still had that feeling from Friday. We were slow, sleepy, nervous, we did not play the fast and modern basketball that we play. In the second half we gathered our heads, we came out together like we always are together on this team, and I am very happy we won. We prepare every game like it is a final, every game is important to us. The Final Four is the biggest level there is, but I played a lot of big games at junior levels, won a lot of medals, and honestly, I think because of that I never feel pressure or fear, even on the greatest stage like this." "Truth to be told, I didn't know about the record and I am proud of it. Of course, I wish I could have beaten it in the Euroleague Championship Game or by hitting more of them against Real Madrid last Friday. We are a little bit frustrated for our loss in the semifinals because I think we arrived in a good moment to the Final Four. We disconnected, all of us, but we have to look forward and we already took a step forwards by winning this game, which is never easy to play. We have to try to win the only title that is left - the Spanish League. Nobody doubts that we are a solid Euroleague team and people respect us for that. We are doing a good job but sometimes only winning matters. People only remember the winners." "We had to show some character. After the loss we had it was really tough for everybody, and it is really hard to play a game like this, but at least the team showed pride and played with heart. We tried as hard as we could. At least we could get out of here with this last win. Of course, it is not what we wanted, but it is something to be third in Europe and at least we could have that." "It was a tough weekend for us. They wore us down. Their pick-and-roll was pretty effective. We had too many mental lapses, me probably more than others. It was a tough third-place game. A lot of people use the excuse [that] it is hard to play, but I am not gonna use that excuse. We have to come out to play ready and focused." " We wanted to come out and play hard, finish our season on a positive note, but I think we are still little disappointed with the Maccabi loss. It still hurts. So that is something that will be in our minds for the rest of the summer, until the start of the next season."